Congrats on making it to the halfway point of #MakeoverMonday 2017. I don't think I'd have hadthe energy to keep it up this year if Eva hadn't joined me, so special thanks to her for her countless contributions, endless ideas, and infectious energy. Life will be hectic these next two weeks. I'm off the Germany for 10 days, helping our German team with Zen Master events in Frankfurt and Hamburg before heading to Exasol Xperience in Berlin next week. 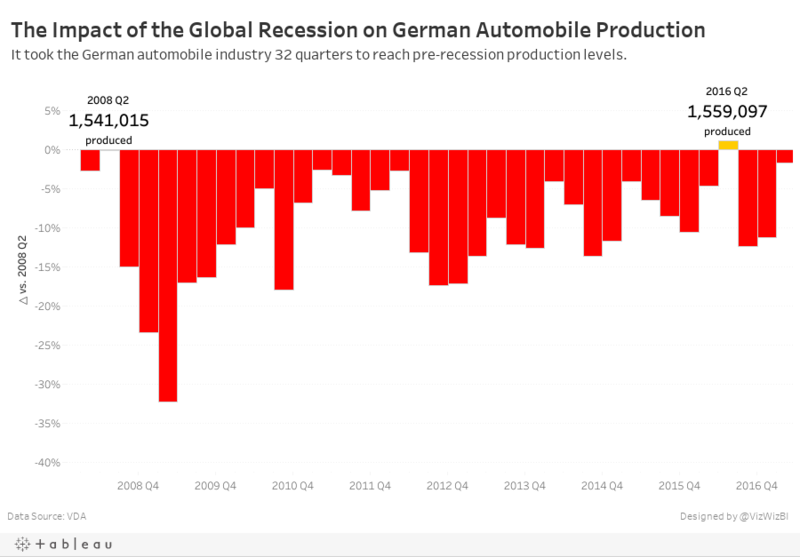 This week, we're looking at German car production to make it more relevant for the #MakeoverMonday live sessions we'll be running. Remove the up and down arrows from the tooltip; they're redundant to the text. It's pretty boring. What's the story? Get it all done in an hour; I'm really pressed for time as I type this. Keep the idea of the tooltips from the original with the BANs. Ok, that's it. Here's my Makeover Monday week 26 viz. Yesterday I was at Exasol HQ trying to help them with their hackathon. I wasn't able to access their data for the hackathon, so I decided to do some testing for them with this week's Makeover Monday data set. I was very interested in looking at state-level air quality and built lots of heatmaps and originally built them in a single worksheet using table calcs to sort out which states go in which columns and rows. I wonder if I can combine a heatmap that looks at daily max reading by state across all years with a tile map. 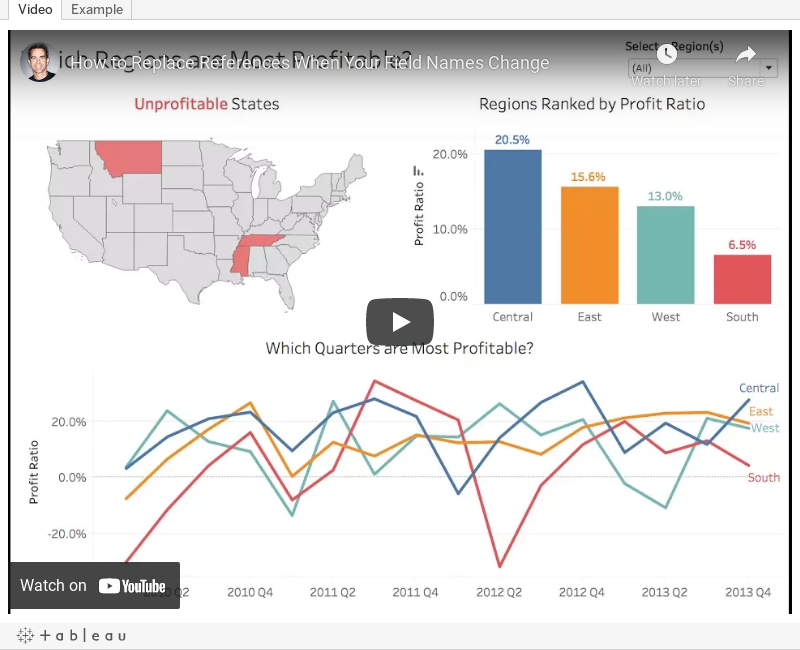 I quickly went to Matt Chambers' great post for how build tile maps added the secondary data source, blended it by state and replaced my crazy table calcs with a simple tile map view. What a fun exercise! 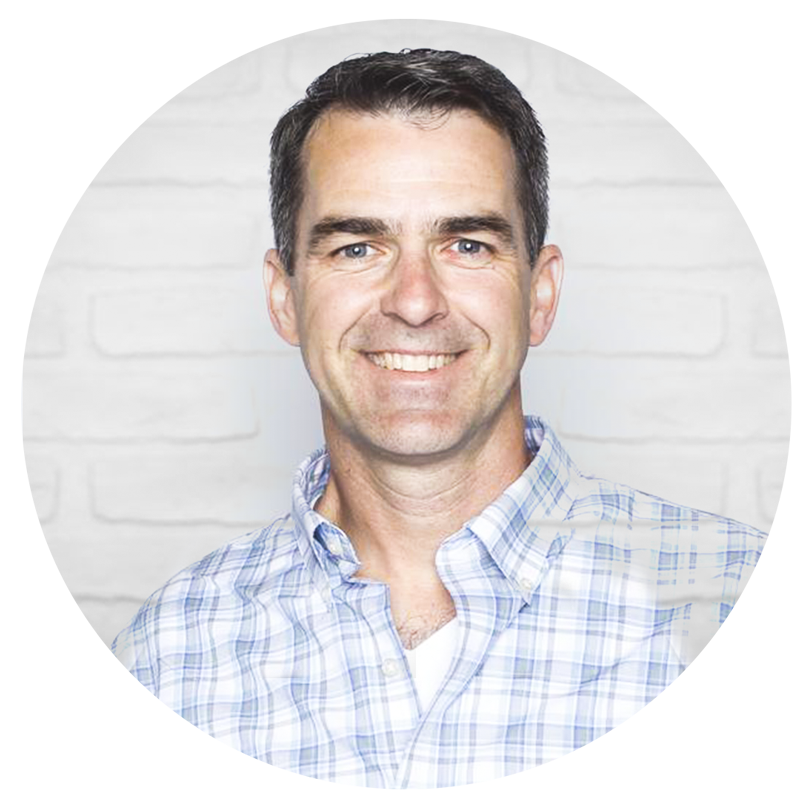 I learned a ton and feel like I created a much more intuitive view. Does anyone recall every seeing a tiled heat map? Have I come up with a new chart type??? Click on the image for the interactive version. Note that the viz might be slow to load as it's displaying about 460,000 marks. Makeover Monday: Is America Improving Its Ozone Air Quality? Eva and I are hosting another BrightTalk webinar this Friday titled "Visualizing Smart Cities: How Data can help shape our communities". This is part of an Internet of Things week for BrightTalk so when deciding what data set to pick for this week, I got to thinking about air quality sensors. A quick google search turned up a treasure trove of data on the EPA website. Thanks for my friends over at Exasol, I was able to create a place for all of us to play with all 202 million hourly measurements. If you want to play with the live connection to all 202M records, you will need a login which you can create via this registration if you do not already have one. The EPA website also contained some basic reporting, which is the focus for this week's makeover. Simple layout. It's easy to see you have days within months going left to right and years going down. The title tells me what I'm looking. Including the date range is a nice touch too. It's difficult to see how a month has changed across the years. I can't hover to see the values. It says each “tile” represents one day of the year and is color-coded based on the AQI level for that day, but I think it's actually showing the max measurement for each day. It should be more clear what they are representing. There's very little context. How does one county compare to others? How does one county compare to the national average? Last year I challenged The Data Duo to visualise an almost identical data set. Pooja created a pretty amazing viz (of course), so I wanted to pick some parts off of it. Particularly, the State selectors on each site and the dot plot. I wanted to understand how each month changed across the years, which is pretty much exactly what a cycle plot was created for. I used a trend line instead of an average though because that seemed to show the patterns better. I wanted to add context for comparisons to the national average and to the state average (which appears when you click on a state). I wanted to use color-blind friendly colors. I wanted a small sparkline-type chart to show how things have changed since 1990. With these goals in mind, here is my Makeover Monday week 25 submission. Click on the image for the interactive version. My main viz with the table and spine chart is all one worksheet. Emma chose to split it into two. My calculation for the % Agree is different than hers. She went with a straight average while I went with a weighted average. For one of the filters I used a data source filter while she used a context filter. Both work, just different approaches. With that, here's my Workout Wednesday week 24. Click on it to see the interactive version. Have you ever had a field name change in your data source? It can be a real pain to update each sheet in a workbook one by one. Conveniently, Tableau has an option called "Replace References" that allows you to swap one field out for another all in one shot. In this example, I demonstrate what happens when the data source changes. You could also apply this method when you simply want to swap out all existences of one field for another. For example, you want to change all used of Order Date to Ship Date. Easy peasy! You can also watch this directly on YouTube here if it doesn't render below. Last week I highlighted a really nice line chart from Business Insider over on my Data Viz Done Right site. As a learning exercise I wanted to recreate their chart while also incorporating the feedback I suggested. 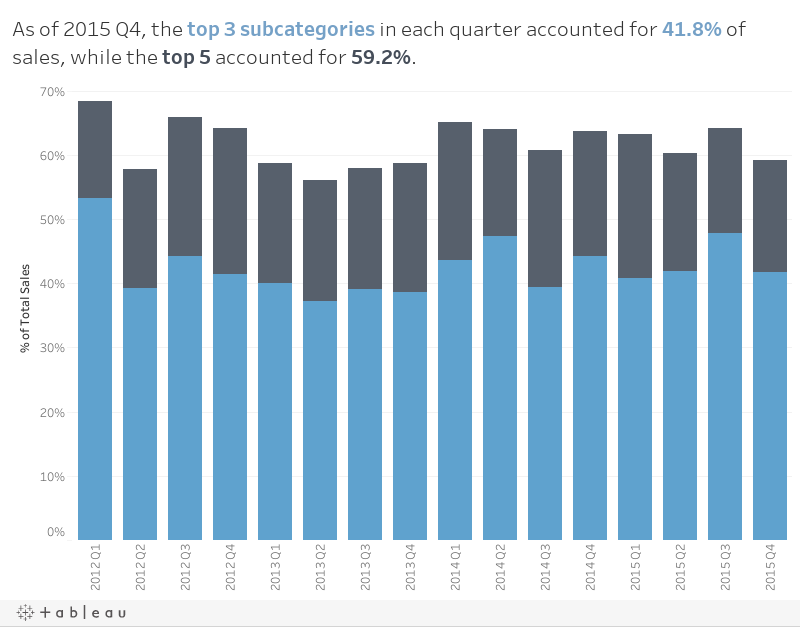 I highly recommend this process to anyone wanting to learn and practice; take a viz you like and try to rebuild it in Tableau. 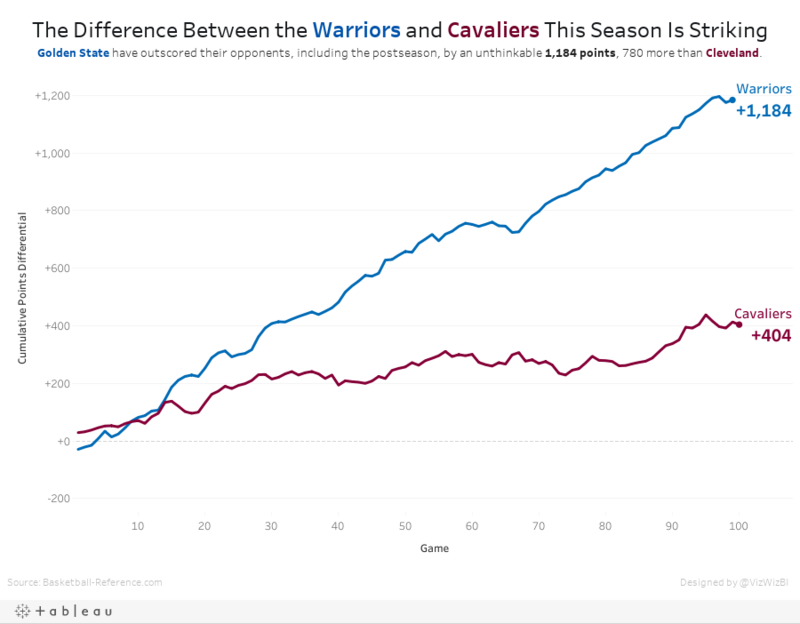 Since the Warriors won the NBA title last night, I've updated the viz with the latest data. Simple, fun, effective visualisation. And the Warriors are pretty damn good! 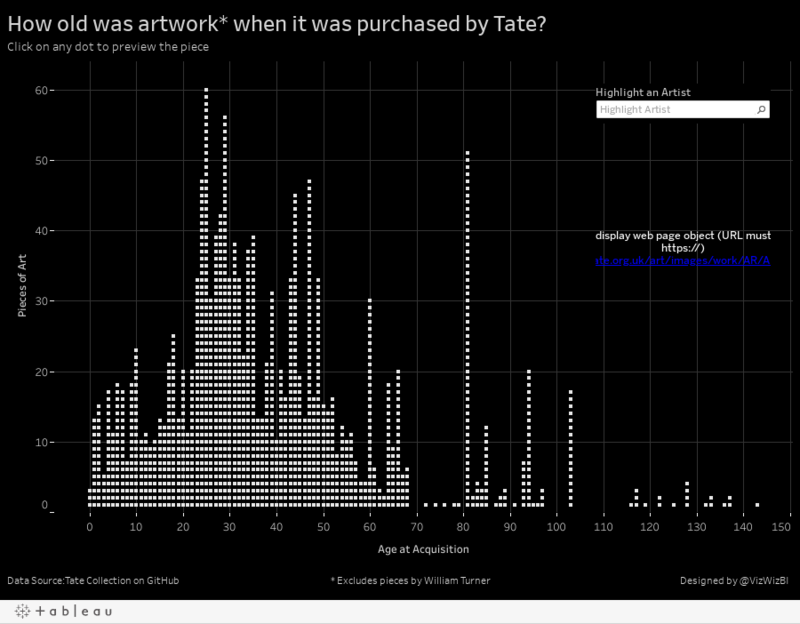 Makeover Monday: How old was artwork when it was purchased by Tate? A pie chart with two slices is really easy to understand. The slices are labeled so I don't have to guess at their values. The largest slice starts at 12 o'clock. Who is Turner? Why does he have such a large proportion? Is the data accurate? HINT: No, it doesn't match with the data on GitHub. There's no reference to the source. There's no really story to it. When I ask "so what? ", I can't answer the question. Since Turner makes up 95% of the artwork, I'm more interested in everyone else. I've filtered out Turner. The Tate seemed to make purchased in bunches. Instead, how about looking at how old pieces are when they are purchased? What is the distribution of the age of the pieces purchased? Provide an option to find an artist. Include a way to view the piece of art as a thumbnail. Display every individual piece of art (inspired by Pooja Gandhi). Provide details in the tooltip. Make it look a bit more "artsy" by going with a monochrome theme. Overall, this data set proved pretty challenging to find any insights. Turner was such a large proportion that I couldn't see anything in the data until I got rid of him. It also helped to hide all of the fields I didn't want to use. Two simple, yet effective ways to make the data more understandable. Whenever Eva is in town we do our best to go to lunch together. One of our challenges is finding places she can eat as a vegan. So when the latest Iron Viz qualifier was announced and the data had to be about animals or plants I thought I would take a bit of creative license and create a viz that can be used by any vegans or vegetarians headed to DATA17 in Vegas. This also gave me a chance to test the new web data connector from data.world. One of the data sets is a list of over 18,000 restaurants that serve vegetarian or vegan food in the US. I took this list, narrowed it down to Las Vegas, eliminated and closed restaurants and joined it to a Excel files that has the websites for each restaurant. It's not anything too complicated nor flashy, but here's to hoping that practicality and usefulness is important to the judges as well. I've also designed it for mobile! This week for Makeover Monday, we looked at a great viz from FiveThirtyEight. For Workout Wednesday week 23, your challenge is to rebuild it in Tableau, with a few twists (because I'm like that). Rank grid lines must be included at 1st, 25th, 50th and 75th. They must be labeled as I've done it. Year grid lines should only be shown for 1925, 1950, 1975, and 2000. When (None) is picked from the highlighter, then it should show the default view (first image below). When a park is selected from the highlighter, it should be the only line displayed and should be displayed as a black line (second image below) unless it's one of the default parks. In that case, it should retain its default color. Align the highlighter as I've done on the bottom left of the chart. I suspect will probably find building the bump chart fairly straightforward. The tricky bits are the coloring, highlighter, park names, labels and grid lines. Feel free to ask questions if you get stuck. Click on either image for the interactive version. I've also included a video demonstrating how the final viz should work. Get the data here. Good luck! 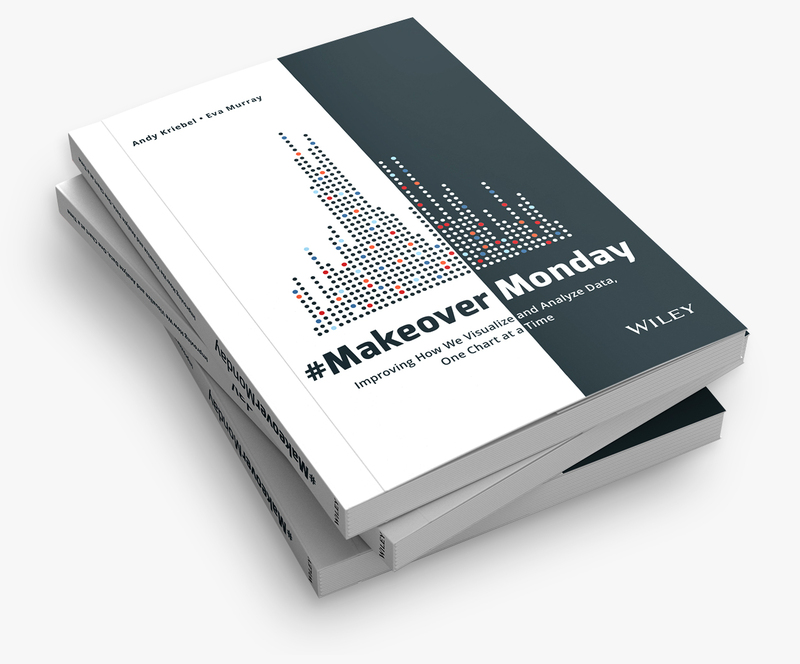 This is a really exciting week for Makeover Monday. It marks the one year anniversary of the first Makeover Monday Live that Andy Cotgreave and I ran last year at TCOT London. This also means that Makeover Monday is live again at this year's TCOT London. These events are so much fun and an amazing way to introduce people to the project. For week 23, we are looking at the popularity of America's National Parks. As an American, I've learned to cherish the amazing, free natural wonders sprinkled around the country. In particular, when we lived in California, we made it a point to visit Yosemite, Joshua Tree and the Grand Canyon amongst other places. They truly are worth a visit. The viz that we are making over this week comes from FiveThirtyEight and it really quite fantastic, like most of their vizzes. The title is very boring. How can I identify a park that's not highlighted? It would be nice to have a way to choose another park to highlight. The top 6 parks are highlighted, but why are the others highlighted? It seems pretty random. While this shows me the most popular parks, it lacks the context of how many visitors and how that has changed over the years. But then I had another question in my head: At State level data, how many States account for 80% of all visitors? 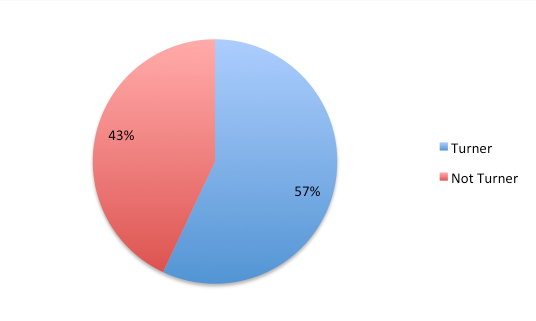 For this, I created a simple Pareto chart. Two vizzes for the prices of one! Enjoy! Click on either image for the interactive version.